Today, I'm going to attempt to explain why America is in political chaos. For starters, our president is demented. 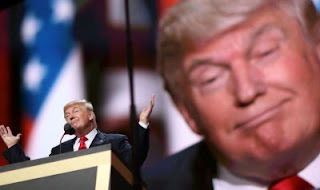 Experts have studied his speech from 30 years ago, and compared it to his speech today, discovering a startling fact - he's definitely showing signs of dementia. Coupled with forgetfulness, and use of filler words and non-specific nouns point to mental deterioration, according to experts. Team Trump is under investigation for collusion with the Russians during the 2016 election. The fallout of the investigations is a lack of important legislation that the Republican Party had hoped to pursue with their dominance in Congress. Instead, GOP members in the House and Senate are torn between slavishly following their leader,or jumping off the Trump train while there's still time. Most are afraid of him. Most don't like him. Most are concerned about getting negative feedback from being associated with Trump and his crazy tweets and conspiracy theories. The only counterbalance to the chaos created by Donny, is the Democratic Party, which is unorganized and uninspired. A grassroots movement to Resist Trump has sprung up since his election. We've seen hundreds of thousands of Americans marching in protest of Trump's policies since the second day after he assumed power. The majority of Americans don't approve of Trump: the man, the king, and the con man. The loosely organized resistance to Trump's reign hasn't produced fresh new leaders with a vision. No great leaders are emerging from the discontented masses. Many Americans still believe Trump's claims about "fake news" despite facts that counter them. This "Tribalism" is the root of our political chaos. We've degenerated from die-hard political partisanship into full-scale tribalism. We're stuck. The era of Trump has descended upon us like a plague. We've all become mute witnesses to the fall of our once proud republic.